27 August 2018: The ability to save threatened species on the brink of extinction is the focus of a new research project at the University of Canberra’s Institute for Applied Ecology (IAE). The project focuses on using cell line techniques – in which cells are grown under controlled conditions – for biobanking, or cryogenically preserving genetic material. 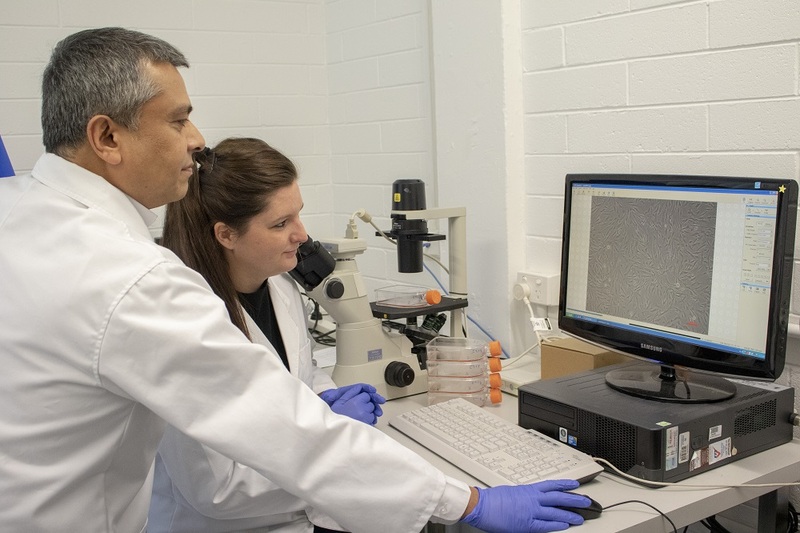 Dr Tariq Ezaz and Julie Strand are working on a project to develop cell lines for biobanking. “The changing definition of biobanking makes it the future of conservation,” Dr Tariq Ezaz, Professor of Genetics at the IAE, said. But there are currently no plans to bring species back from extinction. The project is a collaboration between Randers Regnskov (a tropical zoo in Denmark), the Danish Aarhus and Aalborg Universities and the IAE; working with Dr Ezaz is Danish conservation biologist and PhD student Julie Strand, the manager of the Conservation Biobank at Randers Regnskov. The project is focusing on amphibian and reptile cell lines, due to the large number of conservation issues affecting them – particularly the former. The resulting cell lines will be made publicly available to researchers worldwide, with Ms Strand hoping to cryopreserve them at both the Conservation Biobank and at the University. “It’s insurance of sorts, particularly important for the more endangered species,” she said. “Biobanking should be seen as a way to manage small populations by storing genetic diversity while it is still high, so that if needed, you will be able to reintroduce the stored genes through captive breeding programs, translocations and reintroduction. The more threatened a species, the more important to preserve its genetic diversity – and have a backup. As Dr Ezaz notes, biodiversity requires multiple genetic contributors, making the open access of such genetic material particularly important. Developing cell lines for research and testing also opens up the possibility of reducing the use of animals for lab testing, from medical research to checking effects toxicity on wildlife from routinely used pesticides or fertilisers. Those ethical implications extend to the growing of the cell lines themselves. At Randers Regnskov, tissue samples are taken only from dead animals within 24 hours of their death. Dr Ezaz also uses a non-invasive technique involving skin cells or tissue biopsy to develop cell lines. Growing cell lines for biobanking and research is a more efficient, renewable and ethical technique, he said. Dr Ezaz sees the project as having far-reaching implications across the sphere of biology, including developing genomic resources for biomedical research, study of evolutionary and comparative genomics, and other applications like product testing across the board.